We first run a trademark search to check whether your unique name or logo or one sounding very similar to it has already been taken. Once it is confirmed, you must make the payment for the entire process. We will then send you an authorization letter, which you must sign and return to us so that our lawyers can file your trademark application on your behalf. This form asks for basic details about you (or your business, in case the trademark is being registered in its name), and the logo, word, slogan you’re registering. Pictures must be sent in the JPEG format only. 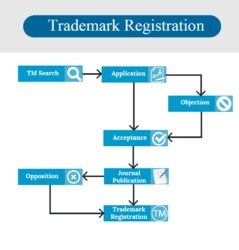 Trademarks must be registered for a particular sector. So if you want to register a trademark in multiple categories, we need to file multiple Form-1s and you would have to pay for them separately. As soon as the form is filed, you can start using the ™ symbol. The Trade Marks Office will first check your application to see if it’s already been taken. If it has, a trademark objection will be raised. The government may also object if it finds the logo obscene, hurts religious sentiments or believes that it is likely to cause confusion. If it has no objection, it makes an advertisement in the Trade Marks Journal. If there is no opposition from other businesses in the next four months, your trademark is registered around six months later. We will check the status of your application regularly over the entire 18 months and keep you up-to-date on the status.